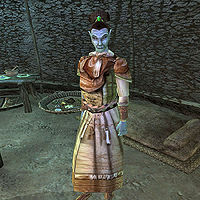 Sonummu Zabamat, a Dunmer Wise Woman, is a Clanholder for the Zainab Ashlanders. Sonummu Zabamat can be found in the Wise Woman's Yurt at the Zainab Camp in the Grazelands Region. In addition to offering counsel as the resident wise woman for the Zainab Ashlander Tribe, Sonummu also sells some basic restorative potions and a small selection of spells.